Figures Candlesticks – Small CAT# SCS- 2 . Lighting Shabbat candles is a rabbinically mandated law in Judaism. Two candles or more are lit on Friday evening, 18 minutes before sundown, to welcome the Sabbath. Candlelighting is traditionally done by the woman of the household, though in the absence of a woman, it is done by a man. After lighting the candles, the woman waves her hands over them, covers her eyes, and recites a blessing. * Each wooden article is hand – painted with a brush using acrylic colors and then lacquered. 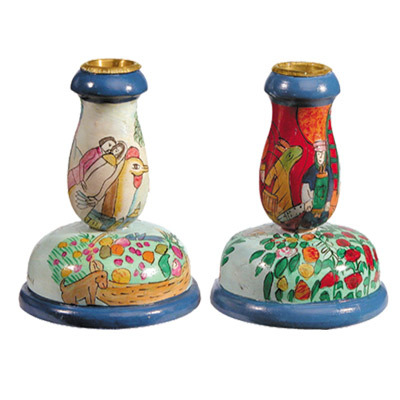 The items can be washed by hand in water since they are coated with several layers of lacquer * Made and Shipped from the Holy Land * Approved by the strictest Kosher Jewish Authorities * Made by Israeli Artists * Best Price Product.